Owzthat - office23s jimdo page! Owzthat is a cricket 'simulation' game which in its non-commercial form is also known as Pencil Cricket as in pre-war Britain when six sided pencils, shaved back to bare wood with the numbers and words written on them, were used. However, it is a poor cricket 'simulation' in that it has no skill element - the chances of scoring a 6 are equal to that for a single, and there is no reference to bowler or fielding action. In an effort to bring a sense of realism (or at least produce specialist batsmen and bowlers) to the game I award certain players 'lives' or a chance to re-roll a die. My version of the game is played with two traditional six-sided long dice and a paper scorecard. One die, the batting die, is labelled 1,2,3,4, 'owzthat' and 6. The second die, umpire die, is labelled 'bowled', 'stumped', 'caught', 'not out', 'no ball', and 'L.B.W.'. The games are of a 20/20 type with five bowlers bowling no more than four six ball overs each - overs have to be bowled by alternate bowlers. The 'home side' always bats first. Batting players 1 and 2, the openers, are give two 'lives' each to account for their batting expertise, those in positions 3, 4 and 5 are each given a single 'life'. Position 6 is the all-rounder and 7 the wicket keeper. The final positions are the bowlers, 8, 9, 10 and 11, these are always out on a 'owzthat' roll. Bowling positions 10 and 11 are the strike bowlers and have a single 'life' each and so may re-roll a die for a more advantageous result. Positions 8 and 9 are the second-line bowlers whilst 6 is the all-rounder. The batting side starts the game by rolling the batting die. Any runs signalled are recorded on the scorecard. 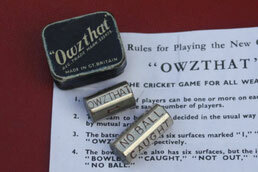 When a 'owzthat' appeal is signalled, the umpire die is rolled for a decision. The batsman has a 1/3 chance of being not out, if the 'Not Out' or 'No Ball' is signalled. As in real cricket a 'No Ball' entitles the batsman to an additional strike (roll) and an extra run. A batsman is out if 'bowled', 'stumped', 'caught', or 'L.B.W.’ are signalled, and the next batsman comes to the crease. (Remembering that batsmen/bowlers have 'lives' they may expend to re-roll any die for a more advantageous outcome). The innings ends when the batting side is all out or when twenty overs have been bowled. The other side then bats in an attempt to score more runs and hence win.